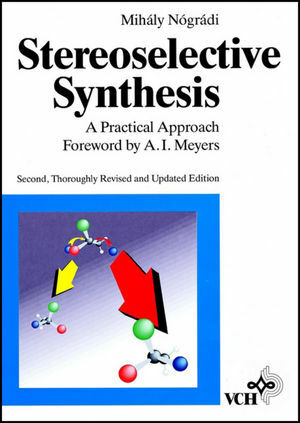 The state-of-the-art in stereoselective synthesis! Much of the information given is presented in figures and tables, which makes the book a valuable reference work for the practically minded organic chemist. Mihaly Nogradi is emeritus professor at Budapest University of Technology and Economics, Hungary. He obtaineat the Technical University of Budapest in 1957 and then became the head of the control laboratory at the pharmaceutical company EGyT in Budapest. In 1962 he joined the alkaloid chemistry group at the Technical University of Budapest. He completed his PhD under the supervision of Professor L. Farkas in 1964 and prepared his "Candidate of Chemical Sciences" thesis in 1967. After spending one year at Sheffield University, UK, he became professor at Technical University of Budapest and was appointed scientifc advisor by the Hungarian Academy of Sciences. He retired in 1996 but retained his laboratory at BME until 2012. He has published 150 papers, authored two books and is coinventor of several patents. Albert I. Meyers - November 22, 1932 - October 23, 2007 - was an American organic chemist, University Distinguished Professor Emeritus at Colorado State University, and member of the U.S. National Academy of Sciences. Born in New York City, Meyers earned undergraduate and doctoral degrees from New York University in 1954 and 1957, respectively. After finishing his graduate degree, Meyers worked as a research chemist for a year before joining the faculty of Louisiana State University as an associate professor. He rose to the rank of full professor in 1964, and was a special NIH fellow at Harvard University in 1965-1966. Meyers later moved to Wayne State University in 1970 and finally to Colorado State University in 1972. Meyers has served on the editorial boards and staff of several major chemical journals, including the Journal of the American Chemical Society. For his work in the area of synthetic organic chemistry, particularly in synthesis of heterocyclic compounds, Meyers was elected to the U.S. National Academy of Sciences in 1994. An endowed faculty chair at Colorado State in synthetic organic chemistry and Meyers synthesis is named in honor of Meyers.